McDonnell Douglas F-4C Phantom II seen in Vietnam in HD. The McDonnell Douglas F-4 Phantom II is a twin-engined, long-range supersonic jet interceptor fighter and fighter bomber. It was used extensively throughout the U.S. Military in the 1960s, particularly the Vietnam War, and remained in service afterwards in the 70s and 80s. It was also used by 11 other nations and still in service by many today. 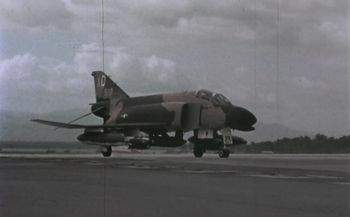 This page lists all films that feature a variation of the McDonnell Douglas F-4 Phantom II. Pages in category "McDonnell Douglas F-4 Phantom II"
This page was last modified on 25 June 2017, at 17:29.